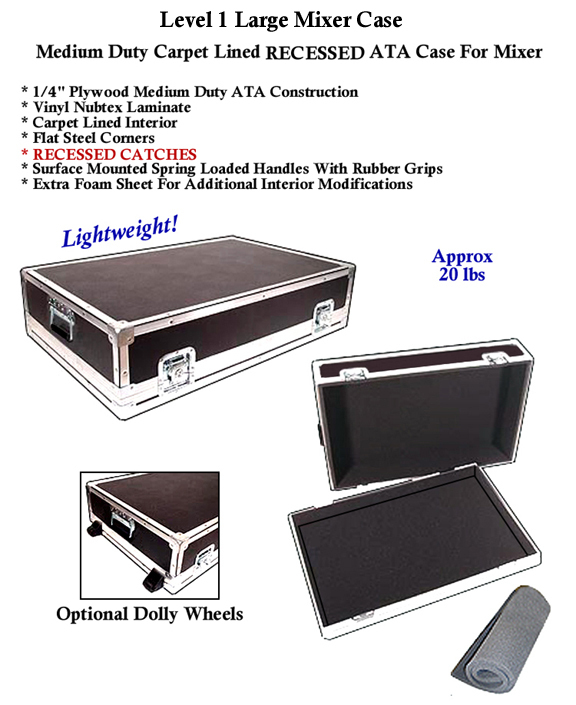 Click the button below to add the Level 1 - LiteFlite Series ATA Case 'Carpet Lined' Recessed Hdwe to your wish list. The Level 1 LiteFlite Series with Recessed Hardware Amp Cases, Keyboard Cases and Mixer Cases are some of our most popular cost-effective cases. They are made with 1/4" plywood with a beautiful black vinyl laminate and riveted with fortifying heavy gauge aluminum extrusions throughout. These cases are finished with anti-rust plated recessed hardware catches and surface mounted spring loaded handles and safeguarded with steel corners. 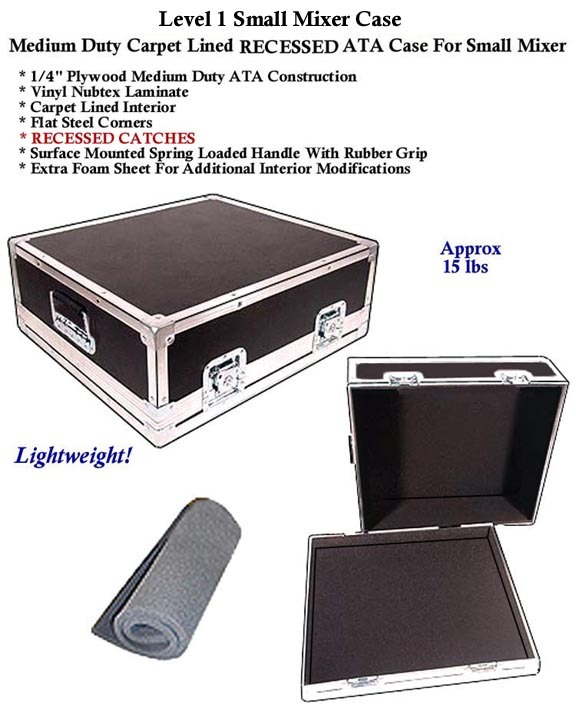 The inside possesses a thick black carpet lining for further equipment reinforcement, and the case comes with an extra foam sheet for additional alterations. 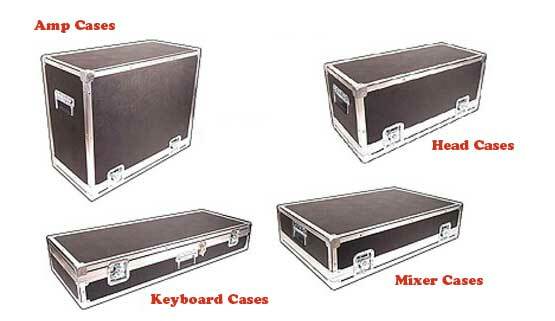 As far as amp, keyboard and mixer cases go, the sheer value they provide is unrivaled. Quality case, great price, fast delivery! This case is well made, sturdy yet light weight. I needed a custom made case for my keyboard, it came promptly and I love the free shipping! no recessed handles and should have given an inch more on board height, not much room for padding. Otherwise I'm ok with case for x32. 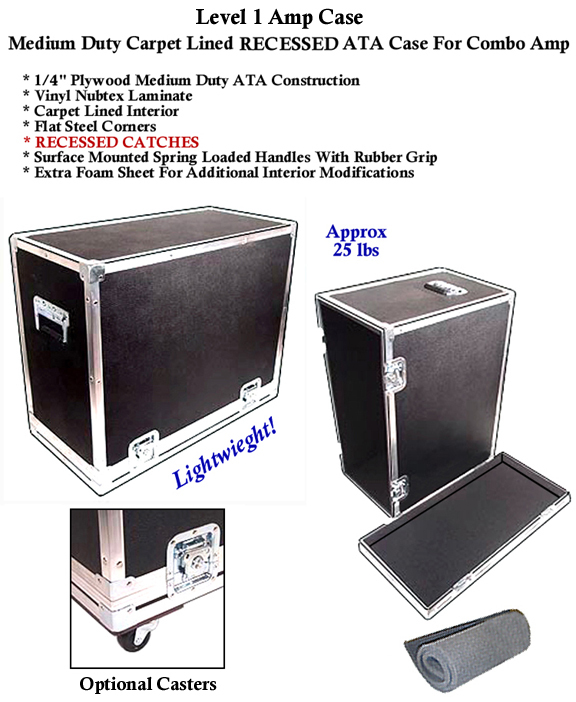 Road Cases USA give you a case that is the exact size and level of finish that you require and are willing to pay for. If you play locally you can get a case that is lightweight and offers a high degree of protection. If you travel extensively with your gear you can pay more and get something bulletproof. I'm a keyboard player and my boards are heavy enough without adding more weight to the things. My Road Cases carrying cases have no extra room inside so nothing is sloshing around, possibly damaging the instrument. 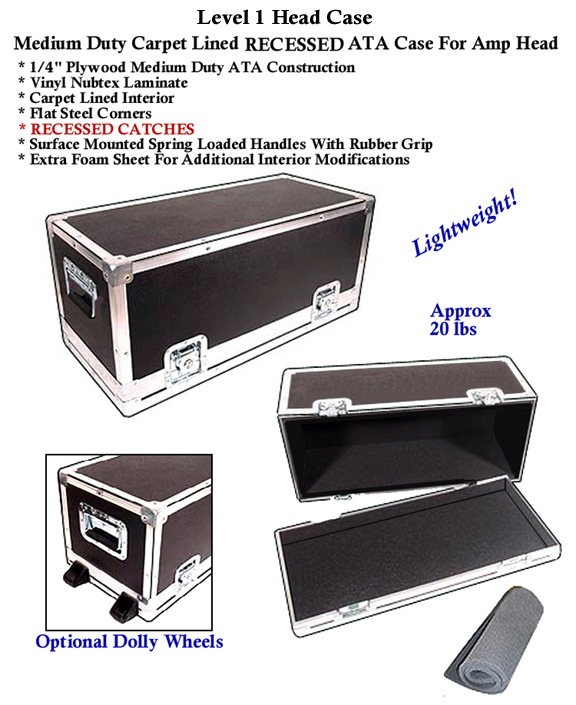 The Road Cases USA products are top notch. I'm a keyboard player with multiple boards, all of which need a hard shell case for gigging and throwing in the back of a truck. Before I discovered Road Cases USA I would try to find an off the shelf case that kind of fit what I needed. The cases were invariably too large,heavy, and not what I needed for a gig worthy case. These cases are EXACTLY fitted to my keyboards in every dimension. Because they aren't too long, wide, or thick I only carry what is required to protect my expensive instrument investments. I own a Nord Electro 4D which is a small, light board but delicate and expensive. The only case off the shelf was too large in all dimensions and the thing bounced around inside unless I stuck foam all over the inside of the case. 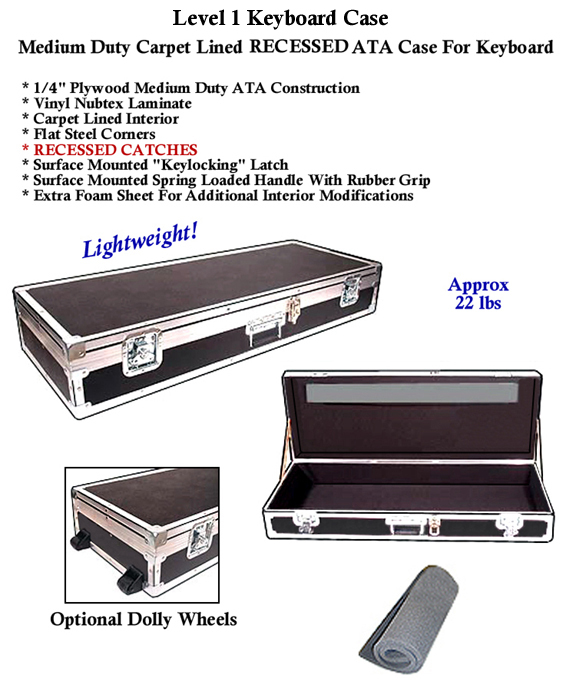 The Road Cases USA case is strong and dimensionally perfect; they are also priced well below anything comparable from SKB or Gator. I use the level one cases because I'm only playing local gigs, but you have the option of purchasing a much more robust product if your transportation needs are more complex. In all this is the perfect solution for anyone carrying instruments around. You pick the level of protection you need and it arrives within a week or less. I'm a very happy customer and will never purchase a case from an on line catalog again. I make this endorsement of my own free will and they are not paying me to say all of this nice stuff. Enjoying the Road-Case I've purchased. Now I know my equipment will stay safe.